When I write about restaurants on Instagram, they’re usually brief takes accompanied by a photo or two. (You can see my feed right here on ethnojunkie.com, updated almost daily, by selecting the “Instagram” category from my home page – no signup required.) But because of Instagram’s character count limitations, it’s often necessary to break up a review into several parts. This one originally appeared as four posts, published on March 14 and 15, and April 13 and 14, 2019. 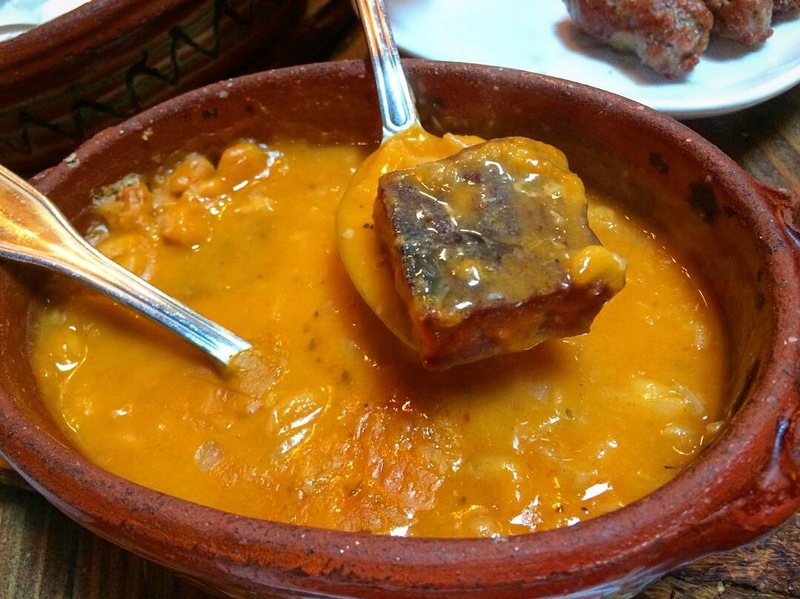 If you’ve never tried Albanian food, here’s your chance. 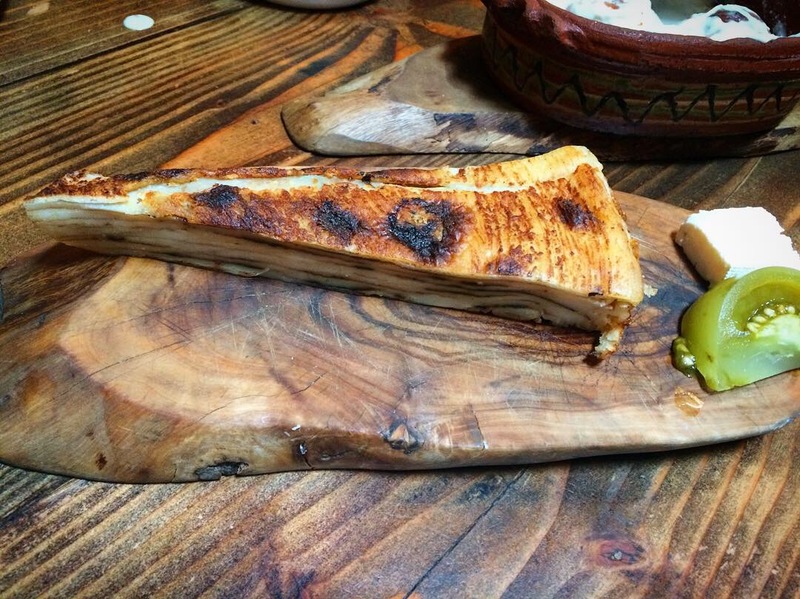 Tucked away in Belmont’s Little Italy, Çka Ka Qëllu can be found at 2321 Hughes Ave, Bronx and it’s a gem. 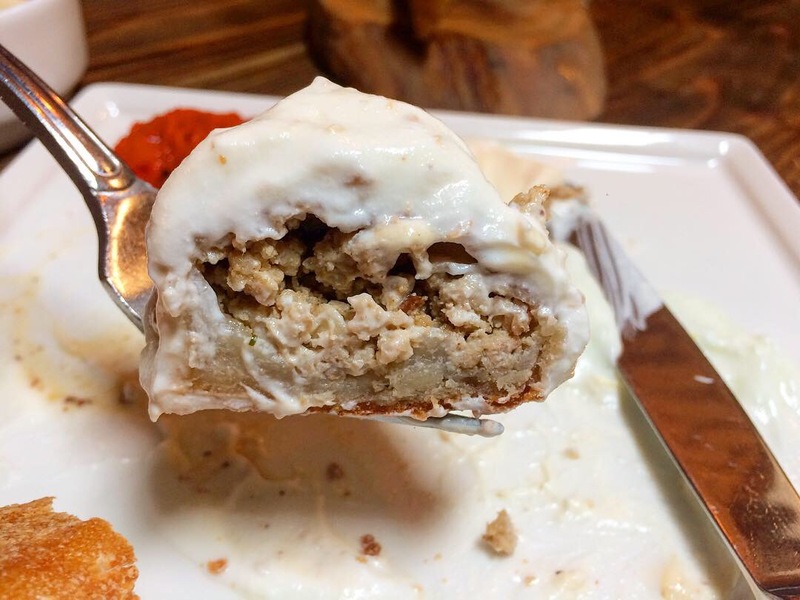 Veal and creamy yogurt have starring roles in this cuisine and everything we tasted was delicious and in many cases a little surprising. 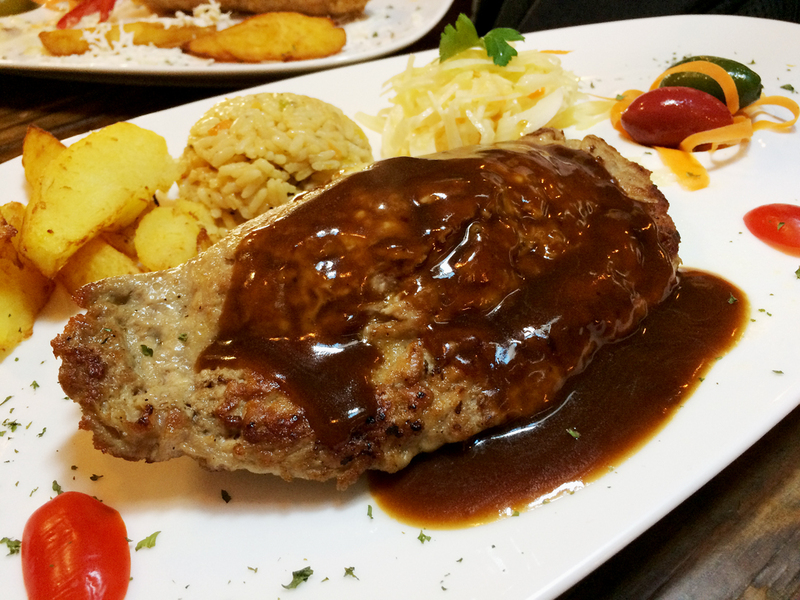 Here are some of the top notch dishes we tried during our three visits. 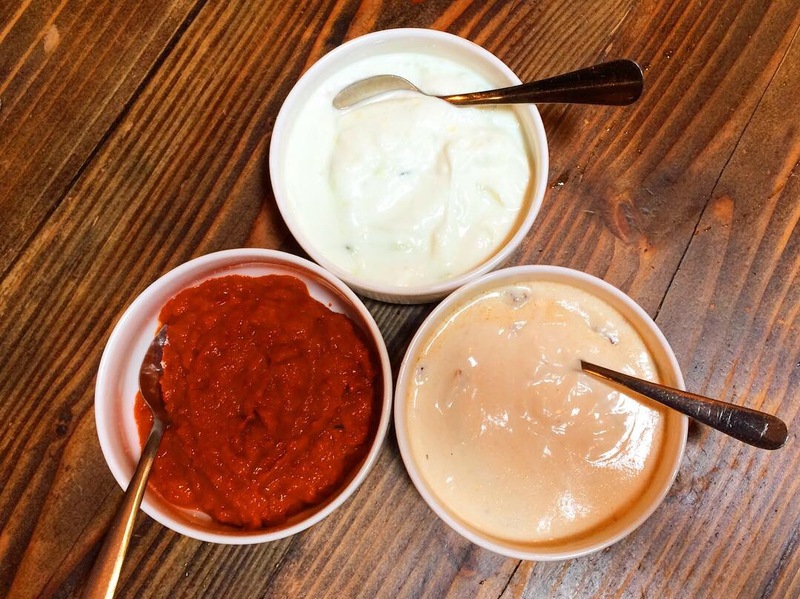 Each dip was different in nature and temperature (from top moving clockwise): Tarator, a cold yogurt dip with minced garlic and cucumber; delicious warm Sausage Dip made from Albanian veal sausage; Ajavar (you may have seen ajvar), room temp, a savory roasted red pepper spread. Marvelous pillowy bread called Samun (sounds a little like salmon), so fresh and hot out of the oven that we literally couldn’t tear it barehanded. I’m usually unimpressed by bread but this was amazing; it was perfect with the dips. A further surprise (because I had no idea what to expect) was this wedge of Fli, savory layered crêpes in the Brumat (Savory Dishes) section of the menu. 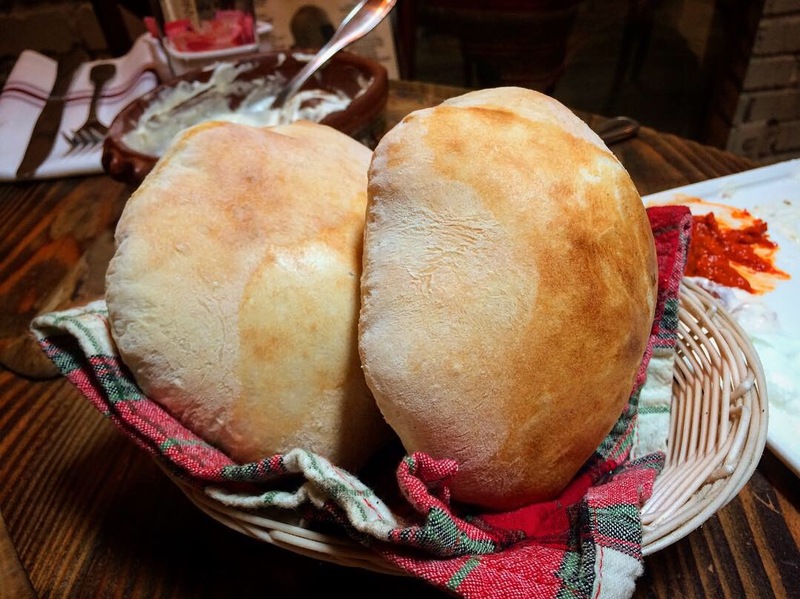 According to the Albanian dictionary, brumat means dough – sounds about right; here, it seemed to be a repository for items that are not really appetizers, not really mains and not really sides, but all dough based in one way or another. A bit of cheese and pickled green tomato kept the fli company on its plank (which matched the table which matched the fli). I was told that it takes six to seven hours to prepare this dish; it took a tiny fraction of that to consume it. I expected the Mantia në Tavë (literally, mantia in a tava, a clay casserole) to be similar to their thin-skinned dumpling cousins called manti from neighboring countries, but was surprised by a drier, sturdier, baked pastry dough encasing the filling; they seemed more like goshtgizhda, the Central Asian meat pies I wrote about recently. These crisp bottomed bites were rescued by a much welcomed creamy sauce. 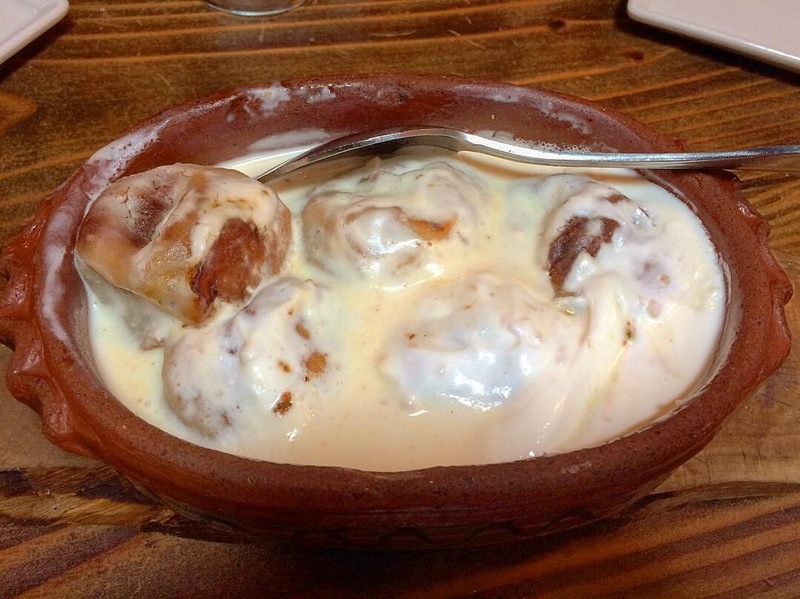 Filled with ground veal (of course) and drenched with yogurt (of course), they were delightful. 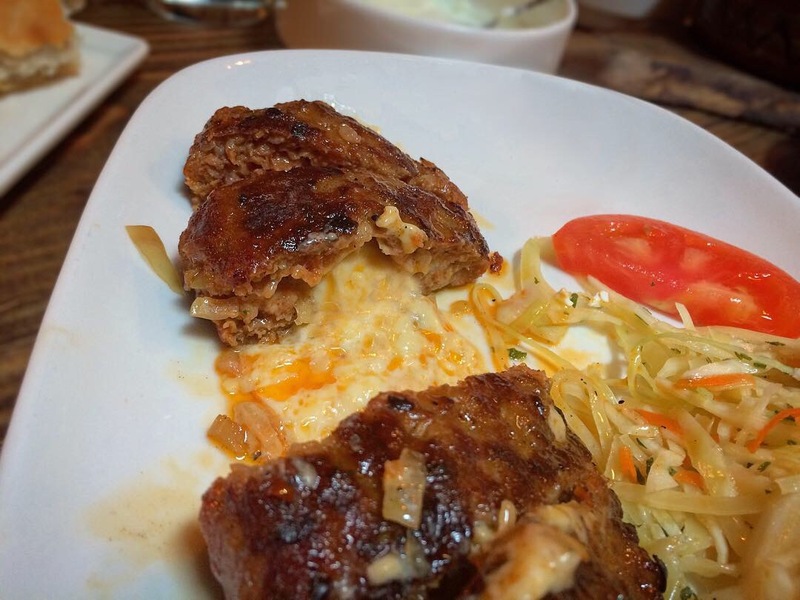 Ground veal mixed with kaçamak (cornmeal) oozing melted kashkaval cheese with a pleasant surprise coming from a touch of spiciness, unusual for this cuisine. A winner. Skenderbeg is named for the 15th century Albanian national hero. It’s pounded veal rolled around a slender layer of smoked mish i thatë (literally “dried meat”) and kashkaval cheese, breaded, fried, and crowned with an aioli mayo. 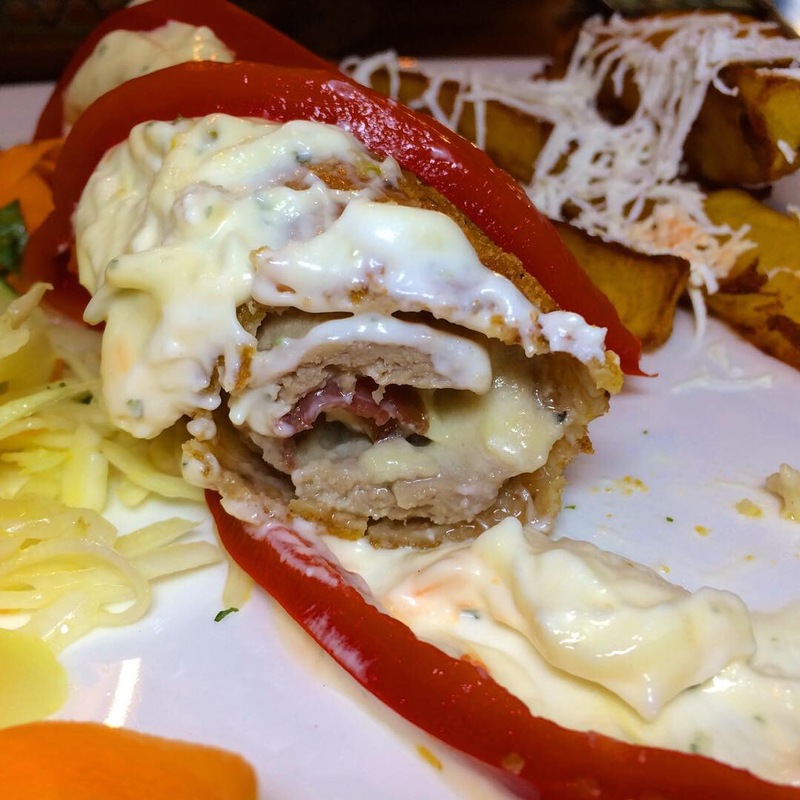 The smokiness leaps out on the first bite and distinguishes the dish from other cheese-stuffed veal dishes on the menu. Outstanding as well. 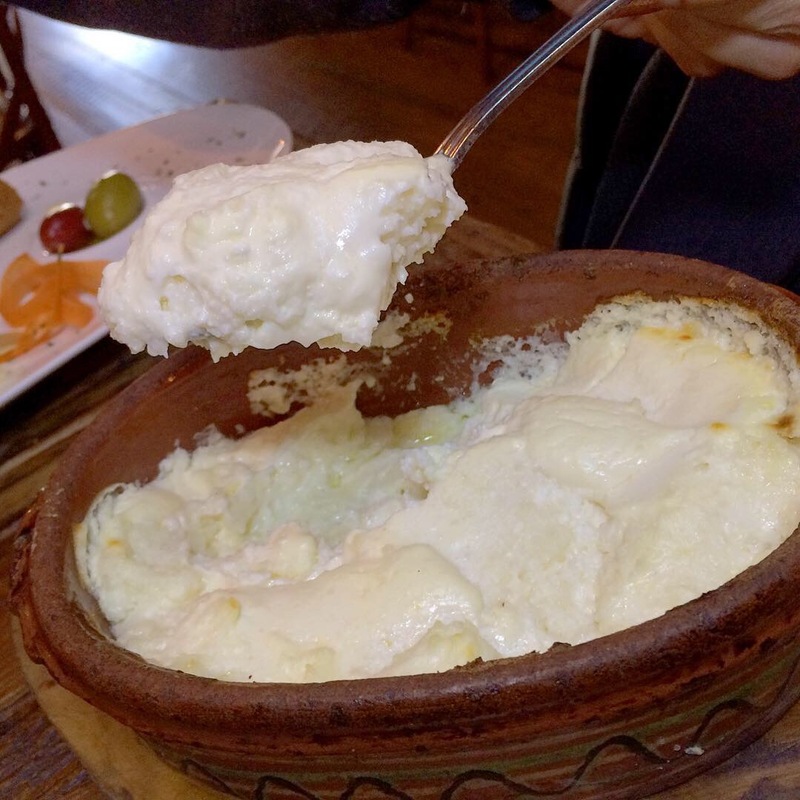 Kaçamak is polenta that’s integrated with a sauce of slightly sour fermented kaymak; note that I said “integrated” and not “topped with” because the dairy is equally potent in terms of flavor balance; it’s the texture that betrays the presence of cornmeal. A friend who knows polenta proclaimed that it was the best he’d ever had. 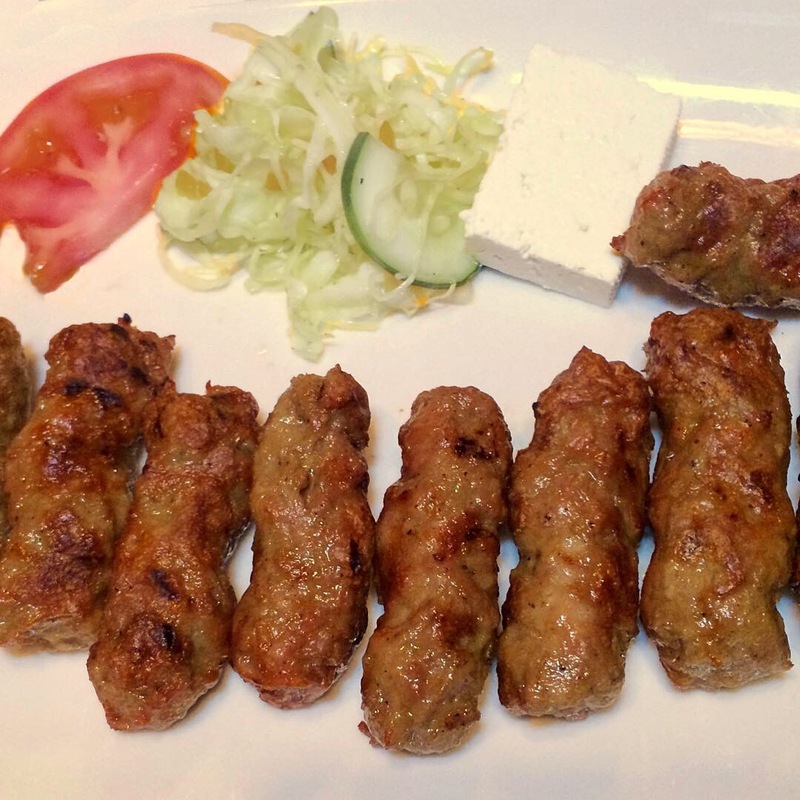 Also known as ćevapi in neighboring Balkan countries, these are finger-sized skinless sausages made from ground veal (natch), onion, garlic, herbs and crushed red pepper (yes, there’s a welcome bit of heat). These juicy cylinders boasting crispy browned edges (bless you, Monsieur Maillard) and a wonderfully fatty mouthfeel come ten to a plate (no, that’s not too many). This thick, creamy, long simmered soup/stew of white beans and onions featured a chunk of smoked meat that infused the dish with its rich flavor. On a subsequent visit, I decided that it might be a good idea to cut it up into bits and stir it back in for the occasional unexpected nibble: yes, it was. 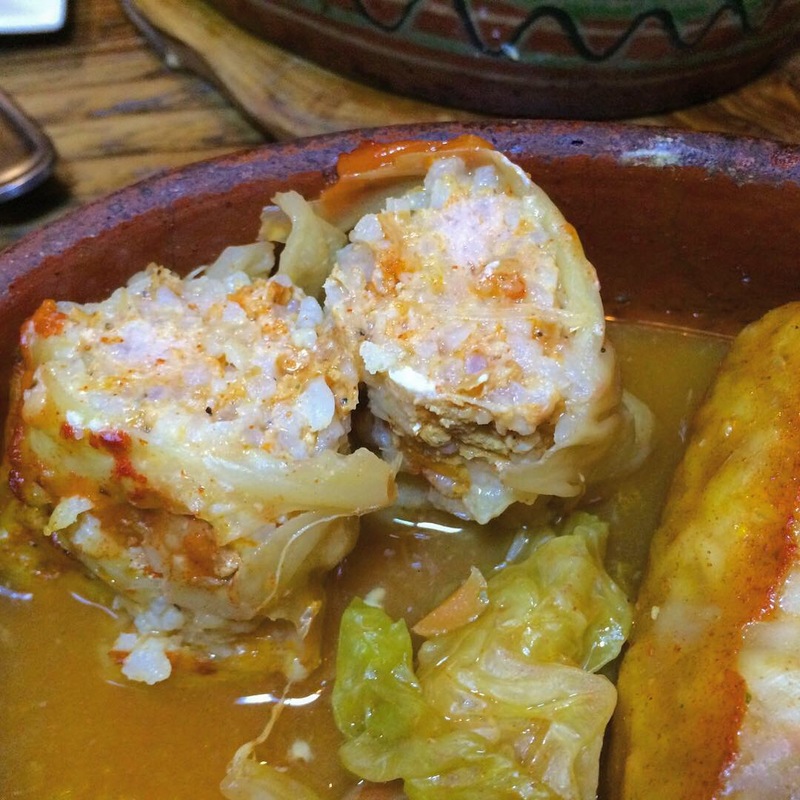 Cabbage leaves stuffed with rice and vegetables. Well-seasoned, I detected paprika and onion powder as dominant. 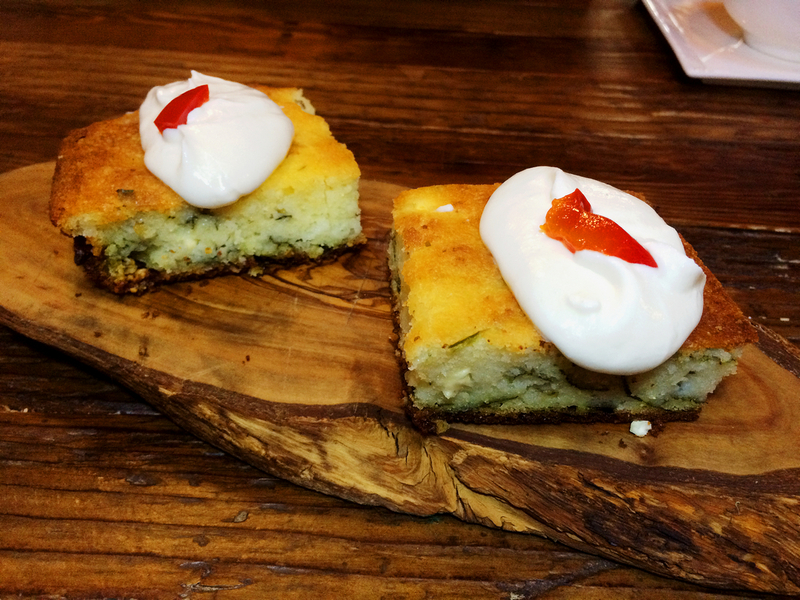 Albanian style cornbread, dense and almost cheesecakey, distinguished by the bits of spinach within. Saving the fanciest for last (although everything was terrific). 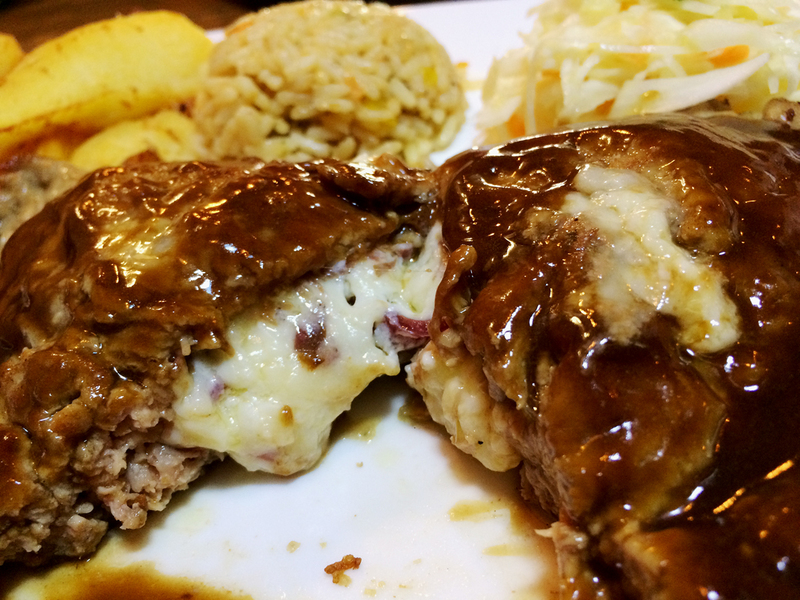 Pounded veal this time (not ground), kashkaval cheese inside: smoky, meaty, cheesy goodness topped with mushroom gravy. Even the rice was tasty. Superb! Çka Ka Qëllu is located at 2321 Hughes Ave, Bronx. 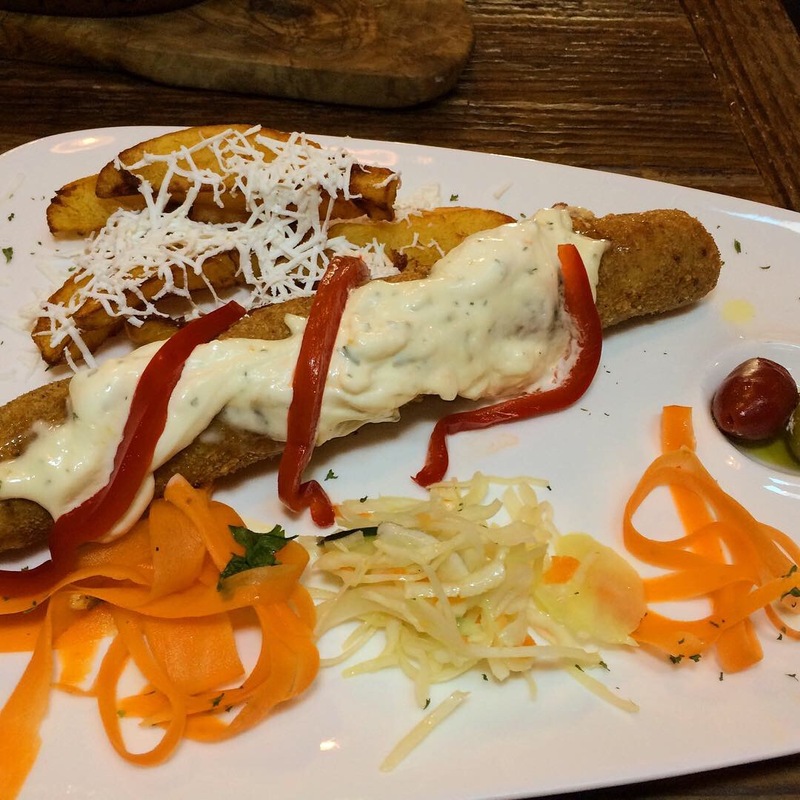 This entry was posted in Instagram, Restaurant Reviews - Extended and tagged Albanian by Rich. Bookmark the permalink.